The company expects the fuel to come from crops grown specifically for that source. That would create what’s called a “carbon sink” or a “carbon-neutral” operation, meaning the crops would pull as much carbon dioxide from the environment as they produce when burned. Biomass is a renewable energy source because the energy it contains comes from the sun. Through the process of photosynthesis, chlorophyll in plants captures the sun’s energy by converting carbon dioxide from the air and water from the ground into carbohydrates, complex compounds composed of carbon, hydrogen, and oxygen. When these carbohydrates are burned, they turn back into carbon dioxide and water and release the sun’s energy they contain. In this way, biomass functions as a sort of natural battery for storing solar energy. As long as biomass is produced sustainablyâ€”with only as much used as is grownâ€”the battery will last indefinitely. An approach that may increase the use of biomass energy in the short term is to burn it mixed with coal in power plantsâ€”a process known as “co-firing.” Biomass feedstock can substitute up to 20 percent of the coal used in a boiler. The benefits associated with biomass co-firing include lower operating costs, reductions of harmful emissions, and greater energy security. Co-firing is also one of the more economically viable ways to increase biomass power generation today. The down side of co-firing is, of course, that it is biomass power, and thus may prove not to be either scalable or sustainable in the long term (see â€œAre biofuels a core climate solution?â€œ). But as a strategy for existing coal utilities to start weaning themselves off of coal over the next two decades, cofiring may be a critical piece. Also, in the event that carbon capture and storage ever proves practical, affordable and scalable â€” which is no slam dunk to say the least (see â€œIs coal with carbon capture and storage a core climate solution?â€œ) â€” then we will certainly want to insist that coal plants with CCS including biomass cofiring. After all, what strategy could be more important for averting catastrophic global warming than pulling CO2 out of the air with biomass and then sequestering that CO2 in underground repositories. 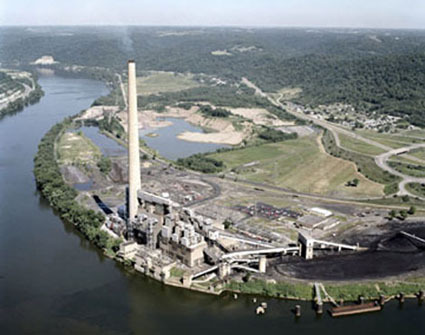 Such coal with biomassing cofiring and CCS â€” BCCCS â€” has the potential to be negative-carbon electricity. This is a very interesting development, and one I wonder if West Virginia Gov. Joe Manchin is paying attention to it … Manchin professes to want West Virginia to be a leader in finding our nation’s energy future. But his energy plan, making its way through the Legislature now, is focused almost solely on coal, without any real teeth to make coal-fired utilities consider projects like the one First Energy has announced. “Negative carbon electricity” – woohoooo! Now there’s a concept to love! So the UCS quoted above never says anything about biomass being a global warming solution (“reduction of harmful emissions” doesn’t sound like CO2) . It calls it “renewable” and then puts a strong qualifier on “sustainable.” So it doesn’t help there. Under Ethanol and the Environment it says “But growing plants for ethanol may reduce greenhouse gases. . . ” MAY, and we’ve seen the blowback on the current ethanol boom (food prices, higher ghg over the lifecycle, etc). So where is the biomass life cycle studies? It wouldn’t be the first time enviro’s like Nilles and Romm have things bass ackwards.